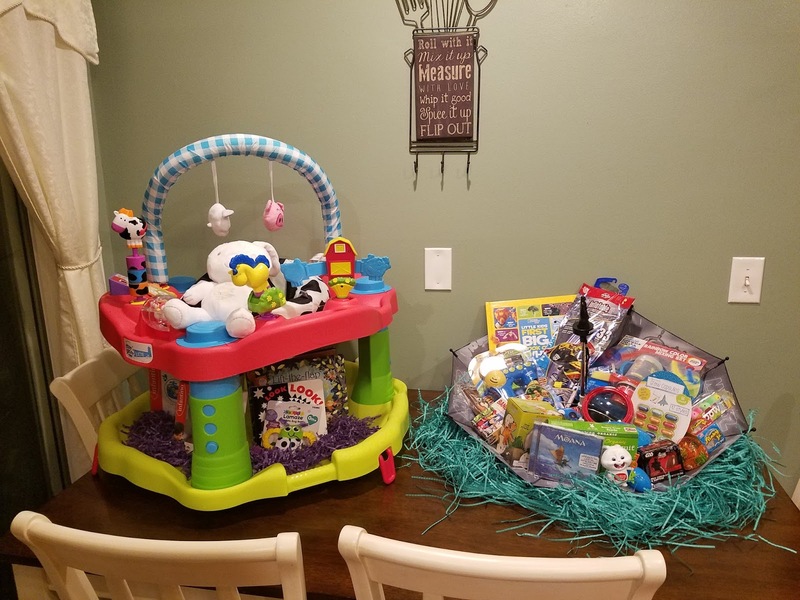 I know the holiday has already come and gone, but I thought I would share what I did this Easter for my children’s “baskets”. This year I knew I wanted to do something different. Of course, how can you not want to do something different when you spend a lot of time on Pinterest searching for ideas (breastfeeding past time)? This year my children were almost 4 years old and 3 months old at the time of Easter. I knew I did not want to have a large basket of candy left for my son because he is a chocoholic. I also wanted to find things that were going to be more useful than little dollar hot spot toys that I was going to wind up throwing away within a couple of weeks. I also knew I wanted somethings that could be used outside as he loves being outdoors. So for his “basket” I went with the umbrella idea from Pinterest. We opened the umbrella and put all of his items inside of it. Which actually was not as easy as it might look because it is not a flat and stable base. My husband actually wound up putting a thumbtack in the umbrella to keep it from falling. Here are the items we put in his “basket”. Now onto the more difficult task. 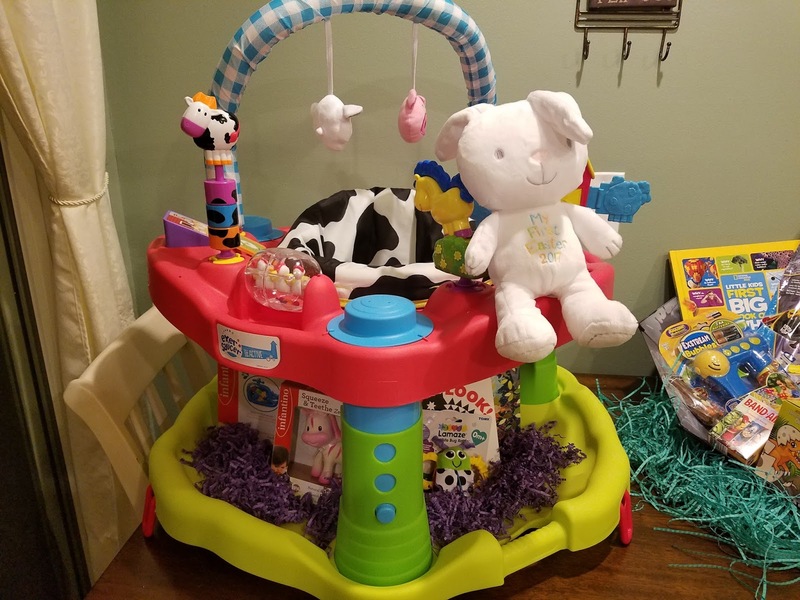 Finding what to get a 3 month old for Easter. I was trying to think what did she really need that we did not have. The only thing that really came to mind was the exersaucer. So I thought, why not put that together and make that her “basket”? So WE DID. Of course I had to find a few more items to add to it. Together I think that they got a lot of things that will be useful and stay useful for awhile. 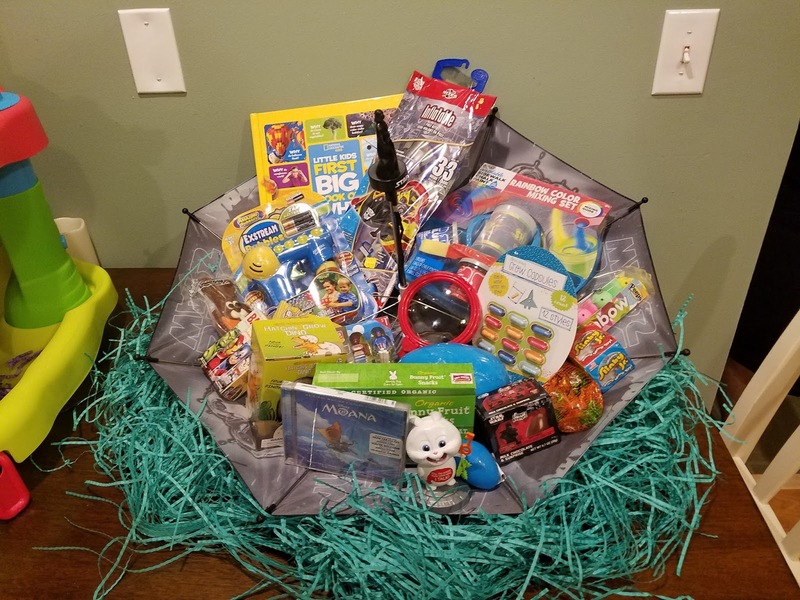 Comment below if you have any unique ideas for Easter “baskets”! Why Doesn’t My Husband Lactate?